Y’all, this has been a week. A week. The kids have both been extra cranky, work has been insane, I’ve dealt with terrible customer service at several different places, we’ve been battling ants in the kitchen all week from all of the rain so the contents of our entire pantry are sitting on the kitchen counters which means I have no place to prepare food (not to mention I can’t find anything), and I have a million and one things on my to do list and just can’t seem to muster the energy to get any of them done. (Hence the reason our Christmas cards are still sitting in a pile on our ant covered countertops instead of hanging on your refrigerators.) And to top it all off, I haven’t felt well at all this week. And that barely scratches the surface, friends. It’s been simply crazy around these parts. Just crazy. I’m hoping and praying that our low-key weekend will allow me to accomplish some things that are long overdue as well as get some much needed downtime with the fam. This is my favorite time of year and it stinks to have had such a poopy week during the best month of all. So today I’m going to post some things that make me happy because, by golly, I’m not going to have a bad weekend, too! I’m going to turn this bad week around right now! A couple of weeks ago, we went to our first Christmas lighting of the season. You may have seen a picture on Instagram, but I never had a chance to post about this particular event here on the blog. There was a little parade, Santa Clause, and lots of lights! After it was over, we had pizza at one of our favorite pizza places in that same shopping center. It was a festive evening and the kids had a great time. I have a video of them dancing around on the sidewalk before the parade started. So sweet! I have already posted a couple of these on the blog, but I had several more pictures from our photo shoot for Little Cosmetics that were too cute not to post. I know Olivia will want to see them one day, and Jacob might, too, since he joined in the fun. Hehe. I mean, how cute are these? ‘Tis the season when it’s extra fun to check the mail! Christmas catalogs, packages pouring in, and my personal favorite – Christmas cards from the ones we love! Our Christmas card holder is starting to fill in and I just love it so much! And to make this year even more special, I have received cards from a couple of my favorite blogging ladies (hey Beth and Jen!) I’ve said it before and I’ll say it again, I just love this blogging community so much! You ladies are all so wonderful and it has been a pleasure getting to know each and every one of you and your families! Well look at that… I already cheered myself up a bit! Here’s to hoping you and yours (and me and mine, hehe) have a joyful weekend! I'm so sorry you are having a crazy week. Hang in there friend because it's bound to get better. :) Ugh, ants are the worst. We had that issue over the summer. It was awful. Drew bought a ton of the traps from Lowes. TJMaxx is definitely the place to go for baking things. I love just walking the aisle and end caps looking at what they have and their Christmas hand towels are amazing!! Yay for Christmas cards!! Best happy mail ever!! Hope your weekend is nice & relaxing for you! Praying next week is better! I hope your weekend is much better! Dealing with ants is no fun whatsoever. I never think to check TJMaxx but looks like I will now! Hope your week turns around! Mine started off like that - I totally slacked last weekend and paid for it, but a few lunches at home to get stuff done did wonders! Not to mention, now it is finally Friday!! Good luck! I'm sorry your week has sucked!! It can only get better, right?? Is Olivia playing with fake make up?? I think I need this, my Mom bought Ella a kaboodle filled with makeup and the girls make such a mess, I need an alternative! "Hello" Beautiful...love it. Yes, loooong week but the splendor of the season and weekend is here shall make up for it as we get our festive on girl!!! Playing dress up sounds so fun....I better get a grand daughter someday, lol. Happy Weekend sweetness!!!! Thank you, Andrea! Yes, I'm hoping that the weekend will redeem the entire week! Today has been good so far, so hopefully Saturday and Sunday will even better! Oh no, I hope things calm down for you soon! Those pictures of Olivia are so adorable and how precious her big brother joined in to help. 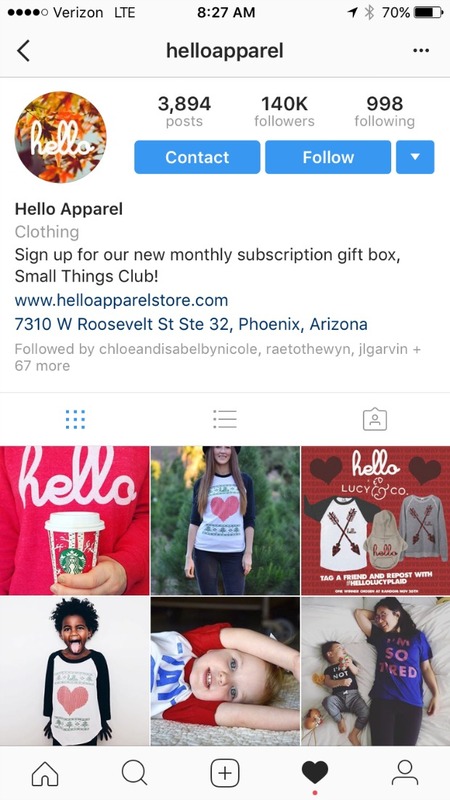 I've never heard of Hello Apparel but I love when companies take the time re-post, that's awesome! Have a great weekend. LOVE Olivia's little photo session, she is just darling and the makeup is so stinkin' cute! How neat that they reposted your picture! I get so giddy when that happens...Pacifica actually reposted my mascara picture from Monday! Second photo of mine that they have reposted, happy day! Hope you have a good, relaxing weekend! I hope you have a better weekend and have some time to get stuff done around the house. Plus spend time with your family. I love Christmas lights and hope that tomorrow night we can take the girls around to go look at lights. I think they will love it. Have a great weekend! I think we could swap what a week stories and have ourselves a good time! Seriously. I'm right there with ya. I will have to check out Hello Apparel. I had never heard of them! Hope your weekend is wonderful! We have had a crazy week as well, next week will be even nuttier, but I'm trying to just take it one day at a time. Yep, that's all you can do! We will do the same! Thanks for stopping by, Jen! Oh goodness friend. I am just now reading blogs from Friday and it seems like everyone had crappy weeks. I hope your weekend is everything you need and that next we all catch a break. Ugh! We get some ants that come in sometimes by our patio door, but they don't really go anywhere else... yet it's annoying and I always have to remember to spray to keep them out... it is usually during the beginning of the summer. :P I hope you have a better week! I am just trying to get everything done before Christmas, it is exhausting... especially since this is the last week my kids are in school! I LOVE those photos of your daughter, especially with the lippy! And, that shirt is SO cute, congrats on being featured! I am so sorry to hear about your week! It breaks my heart. This time of year is stressful enough!! I hope this weekend was just what you needed and more! I absolutely obsessed with the pictures of Olivia in her dress. She is so beautiful! This weekend was so very good to us, Brandi! Thank you so much for your sweet comments! Sorry it’s been such a tough and trying week! I am praying it gets better. The little cosmetics photoshoot is so adorable. How cute is she applying her makeup?! Love her! I have been wanting a Hello Apparel sweatshirt for the longest, but haven’t pulled the trigger. I need to! So cool they reposted your photo! Isn’t the blogging community amazing? About 75% of the Christmas cards we have received have been from blogging friends! Speaking of, can I have your address please ma’am? !